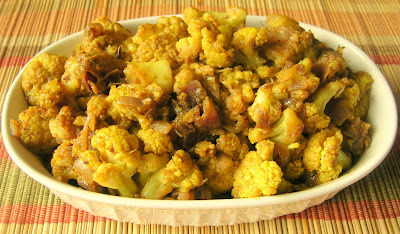 Jaya had posted a wonderful recipe with Cauliflower. The recipe was so tempting that I tried it the same day. It came out really well. It was an instant hit. Here is the Picture of the Milagu Cauliflower that I did. For Recipe Details, Please Click Here. Thanks Jaya, for sharing the recipe. Wonderful looking dish.She is a good cook!:)Enjoy. Jaya: Your Welcome. Your wonderful recipe has brought more beauty to the dish. Asha: Thanks and Credit goes to Jaya. Dilip: Yes, try, you will love this easy and excellent delight. I somehow could not connect to the url for "Pepper Cauliflower". It says link not found... It would be helpful if you would post the receipe in your blog.